“October lived up to its scary reputation—the S&P 500 falling in the month by the largest amount in the last 40 years, the only worse Octobers being ’08 and the Crash of ’87. For perspective, there have been only 5 occasions in those 40 years when the S&P 500 declined by greater than 20% from peak to trough. Other than the ’87 Crash, all were during recessions. There were 17 other instances, over the same time frame, when the market fell by over 10% but less than 20%. Furthermore, this is the 18th correction of 5% or more since the current bull market started in March ’09. Corrections are the norm. They can be healthy as they often undo market complacency—overbought levels—potentially allowing the market to base and move even higher.” This is how Trapeze Asset Management summarized the recent market moves in its investor letter. We pay attention to what hedge funds are doing in a particular stock before considering a potential investment because it works for us. So let’s take a glance at the smart money sentiment towards one of the stocks hedge funds invest in, salesforce.com, inc. (NYSE:CRM). How are hedge funds trading salesforce.com, inc. (NYSE:CRM)? Heading into the fourth quarter of 2018, a total of 86 of the hedge funds tracked by Insider Monkey were bullish on this stock, a 5% rise from the second quarter of 2018. 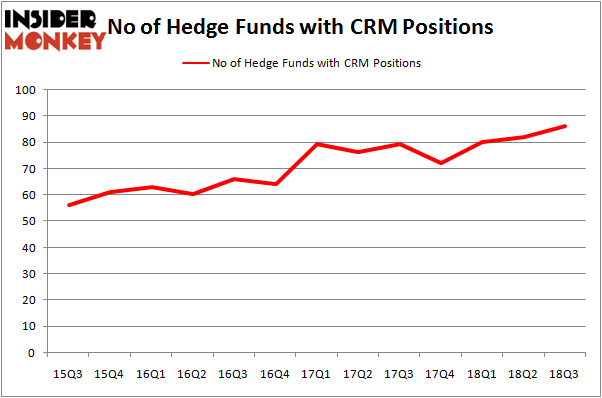 On the other hand, there were a total of 72 hedge funds with a bullish position in CRM at the beginning of this year. With the smart money’s capital changing hands, there exists a select group of noteworthy hedge fund managers who were boosting their holdings considerably (or already accumulated large positions). Of the funds tracked by Insider Monkey, Aaron Cowen’s Suvretta Capital Management has the number one position in salesforce.com, inc. (NYSE:CRM), worth close to $429 million, amounting to 9.9% of its total 13F portfolio. The second largest stake is held by Tiger Global Management LLC, managed by Chase Coleman, which holds a $375 million position; the fund has 1.8% of its 13F portfolio invested in the stock. Some other members of the smart money that are bullish include Peter Rathjens, Bruce Clarke and John Campbell’s Arrowstreet Capital, Ken Griffin’s Citadel Investment Group and Andreas Halvorsen’s Viking Global. Now, some big names were breaking ground themselves. Whale Rock Capital Management, managed by Alex Sacerdote, established the most valuable position in salesforce.com, inc. (NYSE:CRM). Whale Rock Capital Management had $145.1 million invested in the company at the end of the quarter. David Gallo’s Valinor Management LLC also initiated a $94.3 million position during the quarter. The other funds with brand new CRM positions are Philippe Laffont’s Coatue Management, Ian Simm’s Impax Asset Management, and Tom Wilcox’s Cider Mill Investments. 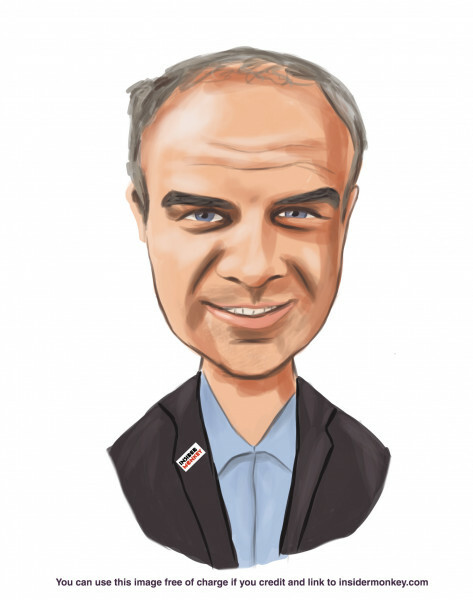 Let’s now review hedge fund activity in other stocks – not necessarily in the same industry as salesforce.com, inc. (NYSE:CRM) but similarly valued. These stocks are BHP Group Plc (NYSE:BBL), Royal Bank of Canada (NYSE:RY), Eli Lilly & Co. (NYSE:LLY), and Altria Group Inc (NYSE:MO). This group of stocks’ market values match CRM’s market value. As you can see these stocks had an average of 29 hedge funds with bullish positions and the average amount invested in these stocks was $1.19 billion. That figure was $5.62 billion in CRM’s case. Altria Group Inc (NYSE:MO) is the most popular stock in this table. On the other hand BHP Group Plc (NYSE:BBL) is the least popular one with only 16 bullish hedge fund positions. Compared to these stocks salesforce.com, inc. (NYSE:CRM) is more popular among hedge funds. Considering that hedge funds are fond of this stock in relation to its market cap peers, it may be a good idea to analyze it in detail and potentially include it in your portfolio.